Are you going vegan this Veganuary? Then you’re not alone. According to the Vegan Society, in 2018, 168,500 people took the pledge. A huge rise of 183% from the previous year, where just 59,200 turned to planted-based foods. Who knows what the figure will be this year. Although the percentage of the population who class themselves as vegan is still small, just over 1% of the population in 2018 (that’s 600,000 people), that percentage has doubled over the past two years with only 276,000 people identifying themselves as vegan in 2016. And according to a report in The Guardian, 1 in 3 Brits have either stopped or reduced their meat consumption. 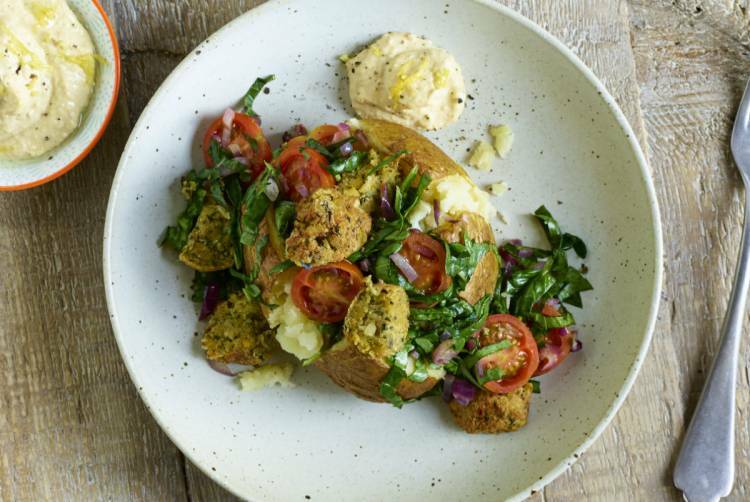 So if you’re considering joining them, or already have, our Ready Baked Jacket Potatoes are a great place to start, a vegan blank canvas, if you will. A great source of fibre, potassium, vitamins C, B1 and B6, as well as many other nutritional goodies, potatoes are also low in sodium and fat, as well as containing no cholesterol. If you’re looking for inspiration on tasty ways to top your spuds, we have some delicious recipes on our website from our Simply Squash butternut squash curry and Falafelly Good combo of falafel, spinach and houmous (pictured), to our Glorious Greens recipe, jam-packed with avocado, chilli, spinach and seeds. Give them a try, we’d love to hear what you think.